You can also pick up your hard copy issue from our stand in the Security Zone at DSEI, Docklands London - 12th-15th September 2017 - Stand N4-198. If you are a professional involved in CNI, come and see us to find out how you can get involved with the International Association of Critical Infrastructure Protection Professionals. 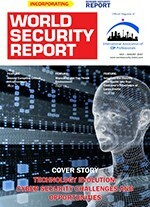 Please find here your downloadable copy of the July/August issue of World Security Report for the latest views and news, incorporating Border Security Report.